Guess how long it stayed down. Go on, guess. 30 minutes? 60 minutes? 90 minutes? Nope. More. Keep guessing. 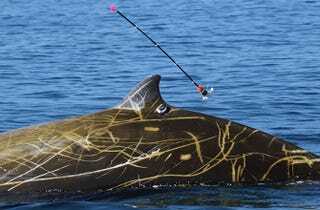 Above: An adult male Cuvier's beaked whale, with satellite tag attached to its dorsal fin. Photo Credit: Erin A. Falcone/Cascadia Research. Humans have been known to hold their breath underwater for over 20 minutes. That's a lot to you and me, but to many of Earth's water-dwelling mammals 20 minutes is a joke, like dunking your head underwater. Take the southern elephant seal for instance — these massive carnivorans routinely hunt squid and fish that live hundreds of meters beneath the ocean surface. Doing so requires them to go incredible lengths of time without air. Their dives have been known to plunge over a mile beneath the waves and last up to 120 minutes long. And, for a while at least, two hours was the record for the longest mammalian dive. No longer. According to findings published in the latest issue of PLoS ONE, the new record holder is the Cuvier's beaked whale. A team led by researcher Gregory Schorr used satellite-linked tags to record the diving behavior and locations of eight members of the elusive species for up to three months, off the Southern California coast. When they were finished, Schorr's team had tracked one whale that dove to a depth of 9,816 feet (2,992 meters), and a second that stayed down for a staggering 138 minutes. "It's remarkable to imagine these social, warm-blooded mammals actively pursuing prey in the darkness at such astounding depths, literally miles away from their most basic physiological need: air," said Schorr in a press release. Schorr's team was monitoring the species to better understand why nearly 70% of the recorded marine mammal strandings associated with military sonar operations involve Cuvier's beaked whales. Such strandings have occurred on beaches in the Mediterranean Sea, the Canary Islands, and the Bahamas, but so far none have been reported in southern California – the site of a Navy sonar testing area, and where Schorr's team conducted its study.